The traditional treatment of Pancoast tumour with local approaches (surgery, radiotherapy or a combination of both) leads to a poor outcome due to the high rate of incomplete resection and the lack of systemic control. The aim of the present prospective feasibility study was to determine whether a trimodality approach improves local control and survival. Patients with stage IIB−IIIB Pancoast tumour received induction chemotherapy (three courses of split-dose cisplatin and etoposide or paclitaxel) followed by concurrent chemoradiotherapy (a course of cisplatin/etoposide combined with 45 Gy hyperfractionated accelerated radiotherapy). After restaging, eligible patients underwent surgery 4−6 weeks post-radiation. A total of 31 consecutive patients with T3 (81%) or T4 (19%) Pancoast tumour were enrolled in the study. Induction chemoradiotherapy was completed in all patients without treatment-related deaths. Grade 3−4 toxicity was observed in 32% of cases. In total, 29 (94%) patients were eligible for surgery. Complete resection was achieved in 94% of patients. The post-operative mortality rate was 6.4% and major complications arose in 20.6% of the patients. The median survival was 54 months with 2- and 5-yr survival rates of 74 and 46%, respectively. In conclusion, this intensive multimodality treatment of Pancoast tumour is feasible and improves local resectability rates and long-term survival as compared with historical series. Until the early 1990s, standard therapy of Pancoast tumour (superior sulcus tumour (SST)) was based on local treatment modalities (surgery, radiotherapy or a combination of both) under the assumption that SST is a locally invasive disease and that the prognosis could be improved mainly by achieving an effective local control 1–5. Thereafter, Pancoast tumour with ipsi- or contralateral mediastinal lymph node metastases has been, and continues to be, considered as a prognostically inoperable disease. Nevertheless, long-term results of the local therapy alone, even with complete resection and without detectable nodal or distant metastases at the time of treatment, are not satisfying, particularly when compared with those of lung cancer infiltrating the chest wall in other locations. The role of induction chemotherapy for nonsmall cell lung cancer (NSCLC) has been extensively investigated in the past decade. Many trials have demonstrated survival advantages for patients with stage IIIA/B NSCLC treated by induction chemotherapy or chemoradiotherapy and surgery versus standard protocols including surgery, radiotherapy or both 6–8. The promising results of an intensive multimodality approach (a combination of chemotherapy, hyperfractionated accelerated chemoradiotherapy and surgery) administrated in stage IIIA/B NSCLC have been the conceptual background for testing in patients with Pancoast tumour 8, 9. This was also supported by the findings of recent studies showing that induction chemoradiotherapy and surgery afford high local resectability rates and long-term disease control for patients with SST 10–12. Patients with a histologically or cytologically confirmed diagnosis of NSCLC of the superior sulcus, with or without Pancoast syndrome, were eligible for the present prospective feasibility study. After complete staging, including obligatory mediastinoscopy, only patients without evidence of distant metastases (i.e. with stage IIB−IIIB of the disease using the criteria reported by Mountain 13) were accepted into the present trial. Further eligibility criteria included a World Health Organisation (WHO) performance status of 0−2, age 18−75 yrs, no prior treatment for lung cancer (surgery, chemotherapy or radiotherapy) and no other concurrent or previous malignancy. Tumour staging was performed by: chest radiography; computed tomographic (CT) scans of the chest, upper abdomen and brain; abdominal ultrasound; radionuclide bone scan; bronchoscopy, including multiple biopsies of prospective bronchial resection margins; and, routinely, cervical mediastinoscopy. In case of suspected subclavian artery invasion, an angiographic CT scan or a magnetic resonance imaging (MRI) of the thorax was performed. A comprehensive interdisciplinary risk analysis was performed before starting treatment and pre-operatively after restaging procedures. This included cardiopulmonary function tests, such as lung function testing, ventilation−perfusion nuclide scintigraphy to assess prospectively post-operative residual lung function, electrocardiogram (ECG) and stress ECG, echocardiography and duplex ultrasound examination of peripheral arteries when clinically indicated. Characteristics that rendered patients ineligible/functionally inoperable were: a prognosticated post-operative forced expiratory volume in one second (FEV1) <1.0 L, a cardiac infarction or unstable angina pectoris in the 6 months before study entry and cardiac disability of class III or greater (New York Heart Association criteria). All patients were required to have a normal white blood cell count (WBC>4,000·μL-1) and platelet count (>150,000·μL-1), renal function (serum creatinine level <1.2 mg·dL-1) and hepatic function (serum bilirubin level <1.5 mg·dL-1). All patients were fully informed about the nature and purpose of the present study by a pulmonologist/thoracic surgeon and a medical oncologist and gave written informed consent before the start of the treatment. Eligible patients were planned for three courses of chemotherapy with cisplatin 60 mg·m-2 i.v. on days 1 and 7 (or 8) and etoposide 150 mg·m-2 i.v. on days 3, 4, and 5. Since 1999, etoposide was replaced by paclitaxel 175 mg·m-2 i.v. on day 1. A move from etoposide to paclitaxel was decided in order to reduce the rate of haematologic toxicity. In fact, most grade 3–4 leukopenia and thrombocytopenia occurred in the first study period (33% versus 18%, p = 0.360). The cycles were repeated every 22 days. Administration of the following chemotherapy course on day 22 was postponed if patients had a WBC count <2,500·μL-1 or a platelet count <100,000·μL-1 until these values were reached. Dose reductions were performed for grade 4 leukopenia, grade 3 leukopenia associated with infection (70% of etoposide dose), grade 4 thrombocytopenia or grade 3 thrombocytopenia associated with bleeding (50 mg·m-2 of cisplatin). In case of reversible creatinine elevations with values 1.5−2.0 mg·dL-1 during the interval, the cisplatin dose was reduced to 50% in the next course. Where creatinine values rose above that value or seemed to persist, cisplatin was replaced by 150 mg·m-2 carboplatin and treatment was continued. Normally, during the 10th week of treatment, the concurrent chemoradiotherapy commenced, combining twice-daily hyperfractionated accelerated radiotherapy (1.5 Gy per fraction >6 h apart, 5 days·week-1, to a total dose of 45 Gy over a period of 3 weeks) with one course of chemotherapy that consisted of cisplatin 50 mg·m-2 i.v. on days 2 and 9 (after the start of radiotherapy) and etoposide 100 mg·m-2 on days 4, 5 and 6. The planning target volume contained the primary tumour with a margin of 1.5 cm enclosing the ipsilateral supraclavicular region, the ipsilateral hilum, the ipsilateral mediastinal and the subcarinal lymph nodes up to 4.5 cm below the carina with a margin of 0.5−1.0 cm. For N2 disease, the contralateral upper and lower paratracheal nodes were included with a margin of 0.5 cm, but not the contralateral hilum. Paraesophageal nodes below the plane of the heart valves were only treated if significantly enlarged on CT scans. Patients with locally advanced (stage IIIB) SST were routinely offered elective cranial irradiation, due to a significant risk of central nervous system relapse 14. Prophylactic cranial irradiation (PCI) was started after the fourth chemotherapy cycle at day 9 of thoracic irradiation. A total dose of 30 Gy in 3 weeks was given with a daily fraction of 2 Gy to the brain and the meninges above the foramen magnum. Two weeks after the completion of radiotherapy, complete restaging, with the exception of mediastinoscopy, was performed and was followed by definitive surgery, where suitable, 4−6 weeks after radiation. The standard surgical technique to access the upper thoracic inlet was first a limited anterior thoracotomy in the second intercostal space in order to expose and cut the anterior end of the first one to three ribs and to evaluate the ventral boundaries of tumour growth, as well as to exclude an invasion of the subclavian vessels. In case of vascular involvement, the incision could be extended to a transmanubrial approach, as described by Grunenwald and Spaggiari 15. After wound closure, the patient was re-placed for a standard posterolateral thoracotomy. The pleural cavity was routinely opened through the posterior access in the 5th intercostal space and the extent of resection was accurately defined. In patients with macroscopic vertebral infiltration, an operative multidisciplinary team with orthopaedic surgeons performed an en bloc vertebral resection. Depending on the dimensions of the primary tumour, a variable amount of lung tissue was removed en bloc. The operative procedures included wedge resections, segmentectomies, lobectomies or pneumonectomies as indicated. In all cases, a systematic lymphadenectomy of the interlobar, hilar and ipsilateral mediastinal lymph node stations was performed (for right-sided thoracotomies: stations no. 2, 4 and 7−11; for left-sided thoracotomies: stations no. 4−11, according to the new regional lymph node classification for lung cancer staging 16). Before and after treatment, patients were staged using International Union Against Cancer criteria 13. Toxicities were assessed using the Common Toxicity Criteria (CTC, version 2.0), Radiation Therapy Oncology Group (RTOG) acute radiation toxicity criteria, and RTOG/European Organisation for Research and Treatment of Cancer late radiation toxicity criteria 17. Surgical resection was defined as complete when the following criteria were satisfied: free resection margins proved microscopically, systematic nodal dissection or lobe-specific systematic nodal dissection, no extracapsular nodal extension of the tumour and the highest mediastinal node removed to be negative. Whenever there was involvement of resection margins, extracapsular nodal extension or unremoved positive lymph nodes, the resection had to be defined as incomplete. Responses to treatment were assessed using standard WHO criteria 18. All patients were monitored every 3 months for the first 2 yrs from the end of treatment and, from then on, every 6 months. Survival was measured from the first day of chemotherapy until death, loss to follow-up or the time of evaluation for the present report. Event-free survival was calculated from the first day of chemotherapy until any event occurred, such as tumour progression, incidence of a second cancer, death due to toxicity or secondary conditions, or death due to second malignancy 19. Survival curves were estimated by the method of Kaplan and Meier 20. Differences in the curves between groups of patients were evaluated using a log-rank test 21. Differences between categorical and continuous variables were comparatively analysed using the Pearson's Chi-squared test and unpaired t-tests, respectively. All given p-values are two-tailed. The primary end-points of the study were overall survival and disease-free survival. Secondary end-points were treatment-related morbidity and mortality, as well as the rate of local relapse as a marker for symptom (pain) palliation. Between 1993 and 2001, 31 consecutive patients with untreated, nonmetastatic NSCLC of the sulcus superior were observed at the Ruhrlandklinik, Essen and the West German Cancer Center, University of Essen, Germany. Ages ranged 31−75 yrs (median 55 yrs). There were 27 males and four females, with a median WHO-performance status score of 1. Almost all patients referred to a physician because of pain in the shoulder area or the arm. The median delay between onset of symptoms and diagnosis of a Pancoast tumour was 3 months (range 1–12 months). In most patients, lung function tests showed no significant impairment. During the same time interval, another nine patients were excluded from the trial; five had been previously treated by radiotherapy alone and four had proved distant metastases at the time of diagnosis. A total of 22 (71%) of the enrolled SST were right-sided and nine (29%) were left-sided. At the presentation, 25 tumours (81%) infiltrated only the bony and soft tissue structures of the upper thoracic inlet and were thus classified as cT3. In the remaining six cases (19%), an involvement of the subclavian vessels, vertebral bodies or both (cT4) was also detected. After completion of staging, including cervical mediastinoscopy, one (3.2%) patient revealed to have lymph node metastases in the hilar station (cN1), eight (25.9%) patients in the ipsilateral mediastinum (cN2mediast) and one (3.2%) patient in the contralateral mediastinum (cN3mediast). A total of 21 (67.7%) patients had no evidence of nodal spreading (cN0). The clinical characteristics are summarised on table 1⇓. All eligible patients underwent the planned induction therapy without treament-related deaths. The first 22 (71%) consecutive patients received cisplatin/etoposide and the remaining nine (29%) received cisplatin/paclitaxel. Treatment compliance was high: 27 (87.1%) patients completed the chemoradiation protocol. Two (6.5%) patients received two of the three scheduled cisplatin/etoposide cycles due to toxicity. In another two cases, induction chemotherapy with cisplatin/paclitaxel had to be stopped after the first cycle. Pre-operative chemoradiation was delivered at the median dosis of 45.0 Gy (95% confidence interval (CI): 44.5–45.8 Gy). All patients received the concurrent cycle of chemotherapy. The incidence of severe treatment-related complications due to toxicity is presented on table 2⇓. Of the 31 patients initially eligible for the multimodality treatment, two (6.5%) patients were not suitable for surgery: one was medically inoperable due to impaired cardiac and pulmonary function at the ultimate risk assessment and the other refused operation. At restaging before surgery, no complete remission could be detected. Post-treatment CT scan of the chest showed a partial response in about one half (48.3%) of the patients and no significant change in tumour volume in the remaining 51.7%. In the patient with cN3-disease, repeat mediastinoscopy was attempted but was stopped due to technical difficulties as a result of scarred mediastinum. In total, 29 patients were operated on 4–6 weeks after completion of radiotherapy with the technique previously described. A total of 22 patients (76.0%) underwent standard lobectomy with systematic nodal dissection. The only left-sided pneumonectomy was indicated by central tumour growth into the fissure. Segmentectomy or wedge resection were performed in the remaining six (20.6%) patients, in whom only a small apical tumour mass was assessed intraoperatively. Reconstruction of the bony plane of the chest wall was necessary in 15 (51.7%) patients. In the remaining 14 patients, scapula and shoulder girdle were able to afford enough stability to the ribcage. No paradox has been observed post-operatively. Thirty-day mortality rate was 6.9%: one patient died of bacterial pneumonia and acute respiratory distress syndrome, and a second one of myocardial infarction and pneumonia. Major complications arose in three (10.3%) patients. Two patients suffered a pleural empyema with bronchial fistula and another underwent re-thoracotomy due to post-operative bleeding. Regarding the histologic type, there were 11 (37.9%) squamous cell carcinomas, 10 (34.5%) adenocarcinomas, four (13.8%) large cell carcinomas, two (6.9%) adenosquamous carcinomas and two (6.9%) poorly differentiated non-small cell carcinomas, not otherwise specified. The microscopic examination revealed the completeness of resection (R0) in 29 (100%) en bloc specimens. In 13 (44.9%) cases no viable tumour could be found. In another seven cases (24.1%), small islands of tumour cells had survived embedded in diffuse scarring tissue. Thus, a complete or near-complete response to induction treatment was observed in 20 (69.0%) patients. In another four (13.8%) cases a clearly detectable tumour regression led to downstaging of disease. A total of five (17.2%) patients were nonresponders, one of which was detected to have an unsuspected lymph node metastasis in the supraclavicular fat tissue that was en bloc resected and was, therefore, classified as having N3-disease. Table 3⇓ shows the surgical−pathological characteristics of the series. On March 15, 2004, median follow-up time for the entire group was 40 months (95% CI 35–74 months; range 24–134 months). No patient was lost to follow-up. The actual overall survival rate at 2 and 5 yrs for the entire population was 74 and 46%, respectively, with a median survival time of 54 months. Regarding the disease-free survival, 2- and 5-yr rates were 67 and 52%, respectively. The clinical stage of the tumour played a major role in determining prognosis: 55% of the patients with stage IIB SST were alive at 5 yrs, while none of the seven patients with stage IIIA reached this limit. Interestingly, patients with stage IIIB SST had a better outcome compared with those with stage IIIA (fig. 1⇓). Positive mediastinoscopy findings led to poorer prognosis, as shown in figure 2⇓: 5-yr survival rates were 21% for cN2–3mediast cases versus 54% for cN0–1 cases (p = 0.02). Nevertheless, long-term survivors were also observed in the group with mediastinal lymph node metastases, with a median survival time of 28 months. The presence of viable tumour cells in the resected specimen worsened the prognosis, as shown in figure 3⇓: 5-yr survival rates were 63% for the complete responders versus 35% for the partial responders (p = 0.10). The extent of lung resection did not influence the long-term outcome. Interestingly, patients undergoing paclitaxel-based induction therapy had a higher 5-yr survival rate as compared with patients treated with etoposide (76% versus 31%; p = 0.16). Survival curves of 31 patients with multimodal treated superior sulcus tumour according to clinical stage. For stage IIB (▴), 17 patients were at risk, seven died, median survival was 80 months and 5-yr survival was 55%. For stage IIIA (▵), seven patients were at risk, five died, median survival was 16 months and 5-yr survival was not reported. For stage IIIB (□), seven patients were at risk, two died, median survival was 35 months and 5-yr survival was 60%. p = 0.01. 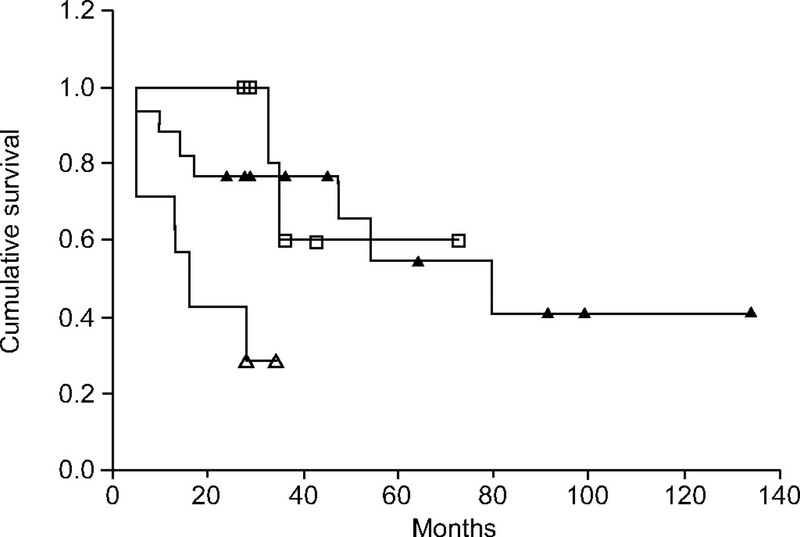 Survival curves of 31 patients with multimodal treated superior sulcus tumour according to pre-treatment lymph node (N) status. For cN0-1 cases (□), 22 patients were at risk, eight died, median survival was 80 months and 5-yr survival was 54%. For cN2-3 cases (▴), nine patients were at risk, six died, median survival was 28 months and 5-yr survival was 21%. p = 0.02. 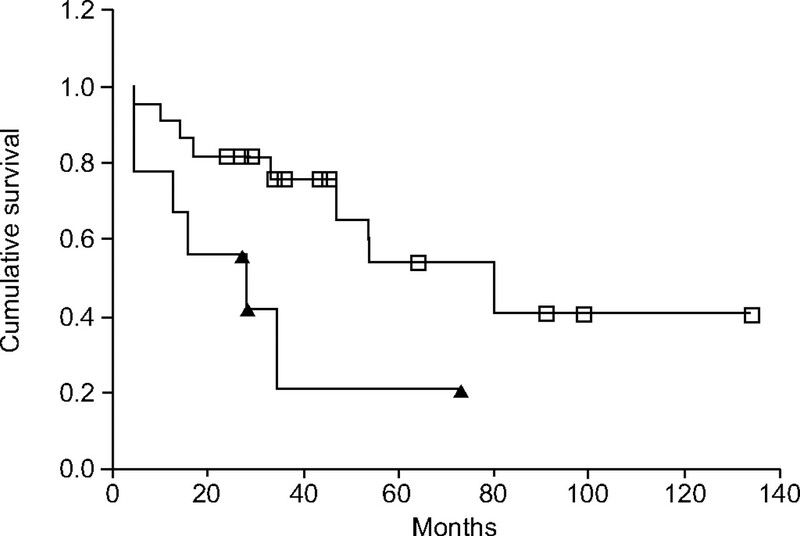 Survival curves of 29 patients with superior sulcus tumour according to pathologic response to induction chemoradiotherapy. In the complete responders’ group (□), 13 patients were at risk, three died, median survival was 44 months and 5-yr survival was 63%. In the partial responders’ group (▴), 16 patients were at risk, 10 died, median survival was 35 months and 5-yr survival was 35%. p = 0.10. There were 11 events of tumour relapse in nine (29%) patients: one (3.2%) patient suffered a local recurrence, seven (22.6%) patients suffered distant metastases and one (3.2%) patient suffered both at the same time. One patient developed a second metachronous primary cancer in the contralateral lung 39 months after treatment of his Pancoast tumour, was radically operated on and died of distant metastases (brain) 13 months later. Local recurrence arose in the ipsilateral lung in a case and in the chest wall in a second one. The most common site of distant relapse was the brain, which was affected in four (12.9%) patients. One of these patients had been treated with PCI. PCI seems to afford a fair margin of protection: only one (7%) out of 13 treated patients (high-risk group) developed brain metastases, while three (21%) among 14 untreated patients (low-risk group) had cerebral recurrence (p = nonsignificant). In the present analysis, none of the investigated factors was able to predict the onset of cancer relapse: neither clinical stage, T- or N-classification, nor response after induction therapy. Although SST recurred with higher frequency in stage III patients as compared with stage II patients (50% versus 29%), in case of T4 tumour as compared with T3 tumour (50% versus 36%), in patients with cN2–3mediast as compared with cN0–1 disease (44% versus 36%) and after partial response as compared with complete or near-complete response to induction therapy (40% versus 33%), none of these differences was statistically significant. Offering patients with Pancoast tumour an appropriate treament with definitive relief of symptoms and reliable chance of cure has been a major challenge for thoracic surgeons and radiation and medical oncologists in past decades. In 1956, Chardack and MacCallum 1 reported the first long-term survivor after en bloc surgical resection and adjuvant radiotherapy with 65 Gy. In the 1960s the combination of radiotherapy and surgery became the standard of care for Pancoast tumour 2. The basic assumption was that SST represents a particular form of bronchogenic carcinoma, which tends to grow locally, infiltrating the surrounding structures of the upper thoracic inlet with lesser propensity to spread to distant sites. Therefore, the main goal of the treatment was to achieve a stable local control of the disease, premise for relapse-free as well as symptom-free outcome. Whereas surgery was regularly part of the treatment in patients with local, potentially resectable disease, radiotherapy alone was offered to patients with medically inoperable or metastatic disease. Over 40 yrs, a large number of series with variable treatment modalities has been published (table 4⇓). In most patients a satisfying, durable control of shoulder/arm pain could be achieved. Nevertheless, complete resection of the tumour despite of “radical” irradiation and extended surgery was possible in only two thirds of cases, and median survival did not reach 18 months in the majority of reports. Recent strategies to improve the treatment outcome have included intensification of radiation therapy (dose per time unit, hyperfractionated accelerated radiation) and concurrent application of chemotherapy together with radiation (concurrent chemoradiation) to achieve additive antitumour effects 56. In a previous study on stage IIIA/B NSCLC by Eberhardt et al. 8, the rationale for choosing accelerated hyperfractionated radiotherapy at the dose of 45 Gy in combination with concurrent chemotherapy, in contrast to the conventional fractionation, has been extensively explained. This treatment modality was expected to improve locoregional control and also to shorten the time until definitive surgery, thereby minimising risks due to fibrotic reactions in the tumour bed and mediastinum. Despite aggressive local therapy modalities for SST, the most common site of first relapse in the reported series was local, occurring in 40% of patients 57. The need for more effective measures for local control of SST and the promising results of an intensive multimodality approach (a combination of chemotherapy, hyperfractionated accelerated chemoradiotherapy and surgery) tested in stage IIIA/B NSCLC 8, 9, have been the conceptual background to design a prospective feasibility trial for patients with Pancoast tumour. This was also supported by the findings of recent studies showing induction chemoradiotherapy and surgery to afford high local resectability rates and long-term disease control for patients with SST. Martínez-Monge et al. 10 reported the results of the first phase II trial with a multidisciplinary approach, which included 1–3 cycles of neoadjuvant chemotherapy (mitomycin/vinblastine/cisplatin (MVP) or mitoxantrone/chlorambucil and prednisone regimen) followed by simultaneous pre-operative chemotherapy and external beam irradiation (46–50 Gy). Treatment-related mortality was high (3/18 patients, 16.6%). Surgery with intraoperative radiotherapy boost was performed in 15 patients, with a 76.4% resectability rate. Pathologic complete response was recorded in 70.5% of patients and 4-yr survival rates for the entire population and the ypT0-subgroup were 56.2 and 87.5%, respectively. In 1998, Attar et al. 23 reported on 11 patients without nodal involvement treated with a course of induction carboplatin and paclitaxel concurrently with radiation therapy at the dose of 60 Gy. The complete resection rate was not stated, but the 5-yr survival rate was 72%. A large prospective multi-institutional trial of the Southwest Oncology Group (Intergroup 0160) 11 enrolled 111 eligible patients with SST and 102 had the planned induction treatment, including two cycles of cisplatin and etoposide chemotherapy concurrent with radiation at the dose of 45 Gy. There were three treatment-related deaths (2.7%), with CTC 3–4 grade toxicity in >40% of patients. A total of 83 (75%) patients underwent thoracotomy and 75 (90.4%) had a complete resection. In total, 54 (65%) specimens showed either a pathologic complete response or minimal microscopic disease. The planned additional boost chemotherapy could be administered to 47 (42%) patients. The 2- and 5-yr survival rates were 55 and 41% for all eligible patients, and 70 and 53% for the complete resection subgroup, respectively. In comparison to the Intergroup 0160-trial 11, the present study registered no induction treatment-related mortality and a slightly lower toxicity (32% versus 40%). A comparable pathologic major response rate was recorded after induction therapy (69% versus 65%), as well as similar 5-yr survival rates. Wright et al. 12, in a retrospective study, compared pre-operative radiotherapy (40 Gy) and surgery with induction chemoradiotherapy (50 Gy with concurrent cisplatin-based chemotherapy) and surgery in node-negative SST. In the former group of patients, complete resection could be accomplished in 80% of patients, while in the latter group it could be accomplished in 93% (p = 0.15). The pathologic response from the induction treatment was complete or near complete in 35% of RT patients and in 87% of the CT/RT patients (p = 0.001). The 2- and 4-yr survival rates were both 49% in the RT group, and 93 and 84% in the CT/RT group (p = 0.001), respectively. Interestingly, the incidence of local recurrence was 30% in the RT patients and 0% in the CT/RT patients (p = 0.02). In a recent report of the Japan Clinical Oncology Group 55, 62 patients without mediastinal lymph node involvement underwent a trimodality approach with two cycles of MVP chemotherapy and concurrent radiotherapy at the total dose of 45 Gy. A total of 49 (79%) of them received surgical therapy and 43 (88% of operated patients) had pathologic complete resection. Microscopic complete response was observed in nine (18%) cases. Treatment-related mortality was 4% and 1-yr survival rate was 76%. In comparison with the aforementioned studies, the present induction treatment protocol was well tolerated, without treatment-related deaths and with an acceptable incidence of major grade toxicity. There was a high compliance rate (87%) to the scheduled chemotherapy and concurrent chemoradiation. All eligible patients underwent surgery within the optimal time window after completion of radiotherapy and post-operative mortality and morbidity did not differ significantly from the published series of neoadjuvant treated, locally advanced NSCLC. A major challenge of surgical treatment for SST was to achieve a complete resection despite the technical difficulties of the anatomy of the upper thoracic inlet. For this purpose, several surgical approaches have been proposed 2, 15, 41. As previously described, the surgical access of choice of the present authors for Pancoast tumour was a combined approach including a limited anterior thoracotomy through the second intercostal space and a classical posterolateral thoracotomy, which allows an anatomical resection of the lung as well as an accurate mediastinal lymph node staging in all cases. A widening of the anterior access was not necessary in the present study, since an infiltration of the subclavian vessels has always been excluded. The finding of 100% of microscopically free resection margins needs to be discussed. In fact, in the two patients who suffered a local recurrence, the R0-status can reasonably be considered a false negative: in the first one, lung cancer relapsed in the residual lobe after segmentectomy and, in the second one, in the ipsilateral chest wall close to the prosthetic implant. Consequently, a “true” complete resection was achieved in 27 out of 29 patients (93.5%). A high rate of pathologic complete response was observed. This is a consistent finding throughout all the studies for SST treated by induction chemoradiotherapy, but it should be emphasised that in other stages (IIIA/IIIB) of the disease the pathologic complete response rate after multimodality treatment is ∼10%. The particular anatomy of the region to be irradiated, the introduction of chemotherapy as radiation sensitiser and the advances of radiation techniques may have played a crucial role in improving local response to therapy. In contrast to all cited studies, the eligibility criteria of the present study also included positive mediastinoscopy, in the conviction that an aggressive multimodality therapy may afford a chance of cure even in such an unfavourable group of patients. In fact, median survival of cN2–3mediast patients was 28 months, with a 5-yr survival rate of 21%, whereas in historical series no long-term survivors have been reported after palliative radiotherapy for Pancoast tumour with mediastinal lymph node involvement. The rationale for an aggressive treatment protocol, including surgery of N2 Pancoast tumour, was also based on the expected good palliation of pain. Pancoast tumour treated by radiotherapy alone recurs locally, with related symptoms, in as high as 60% of patients 30, 32. In the present study only two patients suffered a local recurrence; thus, a durable local control was achieved in 94% of cases. In patients with locally advanced NSCLC who undergo induction treatment followed by surgery, the pattern of failure shifts towards distant failure, notably the brain (15−30% incidence as the first site of relapse). Particularly, the expected incidence of brain metastasis as a first site of recurrence in Pancoast tumour is 24% 28. Brain metastases cause considerable morbidity and disability, thus the prevention or delay of brain relapse may improve the quality of the patient's remaining life, even if the survival is not affected. The late toxicity of PCI is not well characterised, but many studies found no major impairment in neurocognitive functioning attributable to PCI in patients who received moderate total radiation doses and doses per fraction 58. Brain relapse was observed in 13% of patients: 7% in patients treated with PCI (high-risk group) and 21% in untreated patients (low-risk group). Although this difference is not significant, PCI seems to offer a protection against brain metastases, particularly in patients with more advanced disease. Nevertheless, an accurate staging including MRI of the brain before starting treatment is mandatory to avoid the Will Rogers phenomenon as well as to exclude patients with an unfavourable prognosis from such a complex multimodality approach. The introduction of combined chemoradiotherapy as induction therapy has significantly modified the expected outcome of treatment of Pancoast tumour. 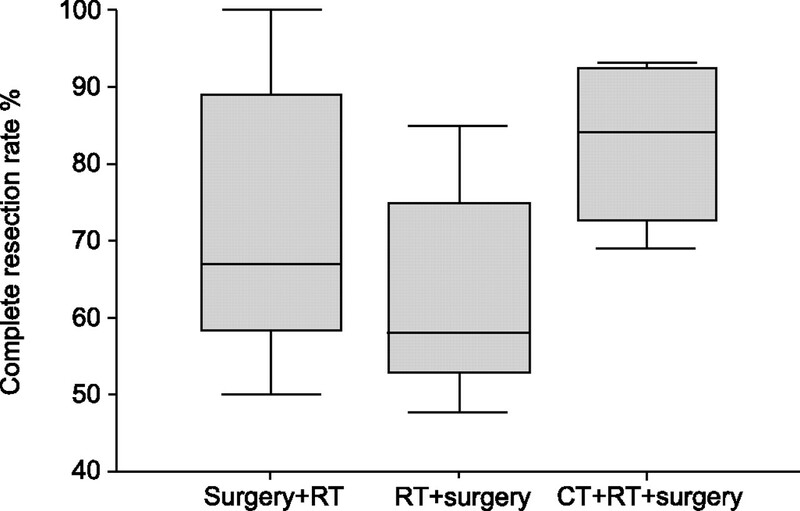 The improvement of surgical complete resection rates and long-term survival after a trimodality approach, as opposed to local therapy modalities, alone or in combination, is well displayed in figures 4⇓ and 5⇓, respectively. Review of the literature on Pancoast tumour. Complete resection rates for surgery and radiotherapy (Surgery + RT; n = 7), radiotherapy and surgery (RT + surgery; n = 14) and chemotherapy, radiotherapy and surgery (CT + RT + surgery; n = 4) treatments. Review of the literature on Pancoast tumour. 5-yr survival rates for surgery (surgery; n = 1), radiotherapy (RT; n = 16), surgery and radiotherapy (surgery + RT; n = 6), radiotherapy and surgery (RT + surgery; n = 21) and chemotherapy, radiotherapy and surgery (CT + RT + surgery; n = 4) patients. The results of this feasibility trial suggest that an intensive multimodality approach based on combination chemotherapy, hyperfractionated accelerated chemoradiotherapy and definitive surgery is well tolerated. It affords a high local resectability rate, a high rate of complete or near-complete tumour response, an acceptable incidence of treatment-related mortality and morbidity and a stable control of disease, both at local and distant sites. Future trials should investigate the role of new combinations of chemotherapeutic agents both as treatment for occult metastases and as radiation sensitisers to improve local control of disease, now that a baseline pathological response rate has been established for the standard regimen with cisplatin and etoposide. The optimal surgical approach includes combined access with anterior (cervico-)thoracotomy to define the ventral boundaries of tumour infiltration and eventually resect the involved subclavian vessels, as well as with a posterolateral thoracotomy to perform a radical lung resection and a complete hilar and mediastinal lymphadenectomy. PCI seems to offer adequate protection against brain metastases, particularly in high-risk patients with locoregionally advanced disease, and should be added in treatment protocols of further studies. When considering that a large randomised trial with patients with superior sulcus tumour may not be performed because of the relative rarity of the disease, the present clinical evidence from several phase II studies, including the present study, suggests induction chemoradiotherapy and surgery to be recommended as modern standard of care for Pancoast tumour. The authors wish to gratefully acknowledge M. Netchaeva for precious assistance in data collection and analysis. Chardack WM, MacCallum JD. Pancoast tumor. Five year survival without recurrence or metastasis following radical resection and postoperative irradiation. J Thorac Surg 1956;31:535–542. Shaw RR, Paulson DL, Kee JL. Treatment of the superior sulcus tumor by irradiation followed by resection. Ann Surg 1961;154:29–40. Paulson DL. Superior sulcus tumors. NY State J Med 1971;1:2050–2057. Kirsh MM, Dickermann R, Fayos J, et al. The value of chest wall resection in the treatment of superior sulcus tumors of the lung. Ann Thorac Surg 1973;15:339–346. Stanford W, Barnes RP, Tucker AR. Influence of staging in superior sulcus (Pancoast) tumors of the lung. Ann Thorac Surg 1980;29:406–409. Rosell R, Gomez-Codina J, Camps C, et al. A randomized trial comparing preoperative chemotherapy plus surgery with surgery alone in patients with non-small-cell lung cancer. N Engl J Med 1994;330:153–158. Roth JA, Fossella F, Komaki R, et al. A randomized trial comparing perioperative chemotherapy and surgery with surgery alone in resectable stage IIIA non-small-cell lung cancer. J Natl Cancer Inst 1994;86:673–680. Eberhardt W, Wilke H, Stamatis G, et al. Preoperative chemotherapy followed by concurrent chemoradiation therapy based on hyperfractionated accelerated radiotherapy and definitive surgery in locally advanced non-small cell lung cancer: mature results of a phase II trial. J Clin Oncol 1998;16:622–634. Stamatis G, Eberhardt W, Stüben G, Bildat S, Dahler O, Hillejan L. Preoperative chemoradiotherapy and surgery for selected non-small cell lung cancer IIIB subgroups: long-term results. Ann Thorac Surg 1999;68:1144–1149. Martinez-Monge R, Herreros J, Aristu JJ, Aramendia JM, Azinovic I. Combined treatment in superior sulcus tumors. Am J Clin Oncol 1994;17:317–322. Rusch VW, Giroux DJ, Kraut MJ, et al. Induction chemoradiation and surgical resection for non-small cell lung carcinomas of the superior sulcus: Initial results of Southwest Oncology Group Trial 9416 (Intergroup Trial 0160). J Thorac Cardiovasc Surg 2001;121:472–483. Wright CD, Menard MT, Wain JC, et al. Induction chemoradiation compared with induction radiation for lung cancer involving the superior sulcus. Ann Thorac Surg 2002;73:1541–1544. Stuschke M, Poettgen C. Prophylactic cranial irradiation as a component of intensified initial treatment of locally advanced non-small cell lung cancer. Lung Cancer 2003;42: Suppl. 1 S53–S56. Grunenwald D, Spaggiari L. Transmanubrial osteomuscular sparing approach for apical chest tumors. Ann Thorac Surg 1997;63:563–566. Mountain CF, Dresler CM. Regional lymph node classification for lung cancer staging. Chest 1997;111:1718–1723. Miller AB, Hoogstraten B, Staquet M, Winkler A. Reporting results of cancer treatment. Cancer 1981;47:207–214. Green MR, Cox JD, Ardizzoni A, et al. Endpoints for multimodal clinical trials in stage III non-small cell lung cancer: a consensus report. Lung Cancer 1994;11: Suppl. 3 S11–S13. Mantel N. Evaluation of survival data and two new rank order statistics arising in its consideration. Cancer Chemother Rep 1966;50:163–170. Attar S, Miller JE, Satterfield J, et al. Pancoast's tumor: irradiation or surgery? Ann Thorac Surg 1979;28:578–586. Attar S, Krasna MJ, Sonett JR, et al. Superior sulcus (Pancoast) tumor: experience with 105 patients. Ann Thorac Surg 1998;66:193–198. Bretz G, Lott S, El-Mahdi A, Hazra T. The response of superior sulcus tumors to radiation therapy. Radiology 1970;96:145–150. Komaki R, Roh J, Cox JD, Lopes da Conceicao A. Superior sulcus tumors: results of irradiaton of 36 patients. Cancer 1981;48:1563–1568. Van Houtte P, MacLennan I, Poulter C, Rubin P. External radiation in the management of superior sulcus tumor. Cancer 1984;54:223–227. Anderson TM, Moy PM, Holmes EC. Factors affecting survival in superior sulcus tumors. Clin Oncol 1986;4:1598–1603. Komaki R, Derus SB, Perez-Tamayo C, Byhardt RW, Hartz A, Cox JD. Brain metastasis in patients with superior sulcus tumors. Cancer 1987;59:1649–1653. Ricci C, Rendina EA, Venuta F, et al. Superior pulmonary sulcus tumors: radical resection und palliative treatment. Int Surg 1989;74:175–179. Komaki R, Mountain CF, Holbert JM, et al. Superior sulcus tumors: treatment selection and results for 85 patients without metastasis (M0) at presentation. Int J Radiat Oncol Biol Phys 1990;19:31–36. Terashima H, Nakata H, Yamashita S, Imada H, Tsuchiya T, Kunugita N. Pancoast tumor treated with combined radiotherapy and hyperthermia – a preliminary study. Int J Hyperthermia 1991;7:417–424. Neal CR, Amdur RJ, Mendelhall WM, Knauf DG, Block AJ, Million RR. Pancoast tumor: radiation therapy alone versus preoperative radiation therapy and surgery. Int J Radiat Oncol Biol Phys 1991;21:651–660. Taylor LQ, Williams AJ, Santiago SM. 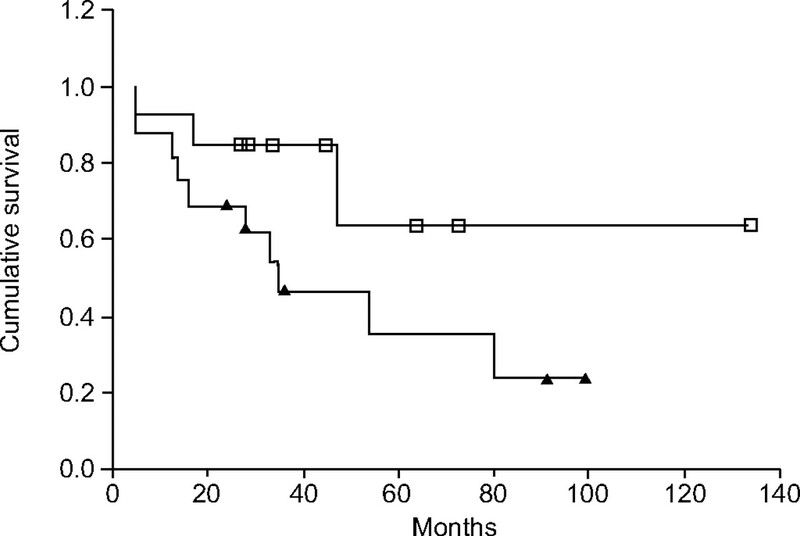 Survival in patients with superior pulmonary sulcus tumors. Respiration 1992;59:27–29. Herbert SH, Curran WJ Jr, Staffort PM, Rosenthal SA, McKenna WG, Hughes EN. Comparison of outcome between clinically staged, unresected superior sulcus tumors and other stage III non-small cell lung carcinomas treated with radiation therapy alone. Cancer 1992;69:363–369. Schraube P, Latz D. The value of radiotherapy in the treatment of Pancoast tumour of the lung. Strahlenther Onkol 1993;169:265–269. Fuller DB, Chambers JS. Superior sulcus tumors: combined modality. Ann Thorac Surg 1994;57:1133–1139. Strojan P, Debevec M, Kovač V. Superior sulcus tumor (SST): management at the Institute of Oncology in Ljubljana, Slovenia, 1981–1994. Lung Cancer 1997;17:249–259. Becker VH, Wacha H, Ungeheuer E. Pancoast-Tumor. Fortschr Med 1977;34:2047–2052. Hilaris BS, Martini N, Wong GY, Nori D. Treatment of superior sulcus tumor (Pancoast tumor). Surg Clin North Am 1987;67:965–977. Sundaresan N, Hilaris BS, Martini N. The combined neurosurgical-thoracic management of superior sulcus tumors. J Clin Oncol 1987;5:1739–1745. Dartevelle P, Chapelier AR, Macchiarini P, et al. Anterior transcervical-thoracic approach for radical resection of lung tumors invading the thoracic inlet. J Thorac Cardiovasc Surg 1993;105:1025–1034. Dartevelle P, Macchiarini P. Surgical management of superior sulcus tumors. Oncologist 1999;4:398–407. Paulson DL. The importance of defining location and staging of superior pulmonary sulcus tumors. Ann Thorac Surg 1973;15:549–551. Paulson DL. Carcinomas in the superior pulmonary sulcus. J Thorac Cardiovasc Surg 1975;70:1095–1104. Miller JI, Mansour KA, Hatcher CR Jr. Carcinoma of the superior pulmonary sulcus. Ann Thorac Surg 1979;28:44–47. Paulson DL. Carcinoma in the superior pulmonary sulcus. Ann Thorac Surg 1979;28:3–4. Wright CD, Moncure AC, Shepard JO, Wilkins EW Jr. Mathisen DJ, Grillo HC. Superior sulcus lung tumors. Results of combined treatment (irradiation and radical resection). J Thorac Cardiovasc Surg 1987;94:69–74. Shahian DM, Neptune WB, Ellis FH Jr. Pancoast tumors: improved survival with preoperative and postoperative radiotherapy. Ann Thorac Surg 1987;43:32–38. Sartori F, Rea F, Calabrò F, Mazzucco C, Bortolotti L, Tomio L. Carcinoma of the superior pulmonary sulcus. J Thorac Cardiovasc Surg 1992;104:679–683. Maggi G, Casadio C, Pischedda F, et al. Combined radiosurgical treatment of Pancoast tumor. Ann Thorac Surg 1994;57:198–202. Ginsberg RJ, Martini N, Zaman M, et al. 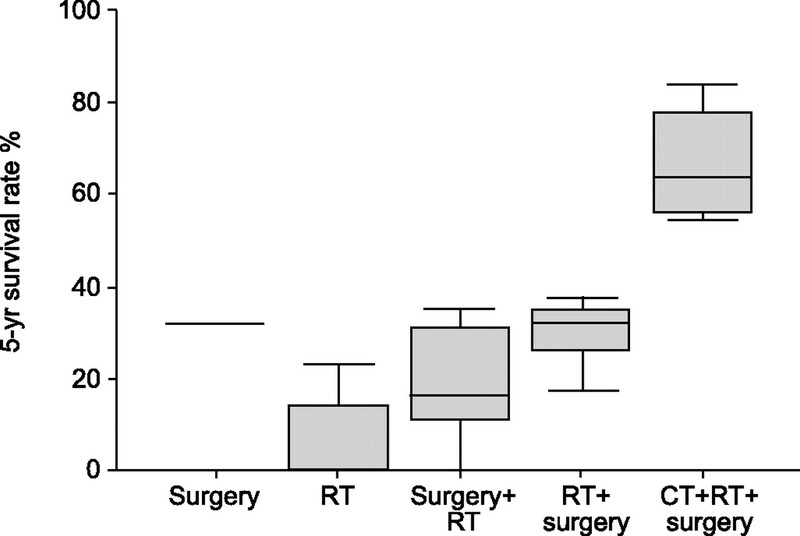 Influence of surgical resection and brachytherapy in the management of superior sulcus tumor. Ann Thorac Surg 1994;57:1440–1445. Muscolino G, Valente M, Andreani S. Pancoast tumours: clinical assessment and long term results of combined radiosurgical treatment. Thorax 1997;52:284–286. Barnes JB, Johnson SB, Dahiya RS, Temes RT, Herman TS, Thomas CR Jr. Concomitant weekly cisplatin and thoracic radiotherapy for Pancoast tumors of the lung: pilot experience of the San Antonio Cancer Institute. Am J Clin Oncol 2002;25:90–92. Vokes EE, Weichselbaum RR. Concomitant chemoradiotherapy: Rationale and clinical experience in patients with solid tumors. J Clin Oncol 1990;8:911–934. Rusch VW, Parekh KR, Leon L, et al. Factors determining outcome after surgical resection of T3 and T4 lung cancers of the superior sulcus. J Thorac Cardiovasc Surg 2000;119:1147–1153. Stuschke M, Eberhardt W, Pottgen C, et al. Prophylactic cranial irradiation in locally advanced non-small-cell lung cancer after multimodality treatment: long-term follow-up and investigations of late neuropsychologic effects. J Clin Oncol 1999;17:2700–2709.